It’s always an adjustment when the back-to-back travel ends and I find myself at home for an extended period of time (longer than a week or two). Putting the suitcase away and unpacking the toiletries is the final concession that I’m staying put for a while. . . NOW what do I do? I try to get back into my daily routines: wake up early, go for a run on the beach, go to the office, have dinner with friends, go to a concert. It takes a while to settle in and I find myself missing the airplanes, taxis, new restaurants, different experiences, and meeting new people. It takes a lot of will-power to not just jump on the next plane to Kauai, San Francisco, or Vegas, or hop in the car and drive to San Diego (although any number of those things may happen within the next week). Thankfully, there’s plenty of adventure at home! I’ve been home for 3 weeks now – quite possibly the longest stretch I’ve gone without traveling this year – and have had several fun journeys. It’s been a nice reminder that I can travel in my own city. Earlier this month I ran the Pasadena Half Marathon with my good friend, Jen. I haven’t been to Pasadena in years and forgot how simply going to another community can feel like a vacation! First, we ran through the beautiful tree-lined streets, passing by some magnificent homes. The colors of the leaves had changed and there was evidence that we actually do experience “seasons” in LA. It felt like we were in New England, only warmer. The second third of the course was spent on dirt trails in the hills. You can truly get lost in the mountains and forget that you’re anywhere near a city. There was one hill that was long and steep. Most people walked it (myself included) and many were out of breath at the top. I couldn’t help but laugh when we arrived at the top of the hill to find a sign marked “Devil’s Gate.” We hit the pavement again for the last portion of the course. Crossing the finish line was fantastic because it signaled the end of the run… and the beginning of breakfast! The Getty - sometimes it's too nice to inside! The following weekend my friends Juston and Laura came to town. We spent a beautiful Sunday afternoon up at The Getty. Juston and Laura are both artists so I felt inclined to warn them that while we have every intention of going inside the museum, many visits to The Getty are spent entirely outdoors. They chuckled (perhaps in disbelief) and said, “well, of course we’ll go inside!” But we began our adventure outdoors, walking the gardens, admiring the way the buildings “framed” LA perfectly, looking at the ocean on one side of the property and snow on the mountains on the other side. We ate brunch and then attempted to go inside the museum. We were in one building for a few minutes, then another, and then Laura said,”you know, it’s so nice outside, I feel like we should be soaking up the sun!” And so, as most days at The Getty are spent, we ventured back outside, sat on the grass, watched kids roll down hills and scale walls, while we caught up and took in the view. And finally, last weekend my friend Heather and I planned a mini-vacation. She lives in San Diego so we met in Newport Beach, half-way between Santa Monica beach and Mission Beach. We spent the day at the beach, bouncing between restaurants, bars, coffee shops, and bakeries, with outdoor seating. It was so warm and beautiful that we had to keep reminding each other that it was December 28th. In between all of that was a bunch of live music. From Ben Harper at The Mint to Ozomatli at House of Blues, to Hotel Cafe family reunions and holiday shows. . . it’s been a non-stop adventure since I returned home! For all the good times, defining moments, and magical experiences I’ve had (and there have been many), it’s always a blessing when another comes along. 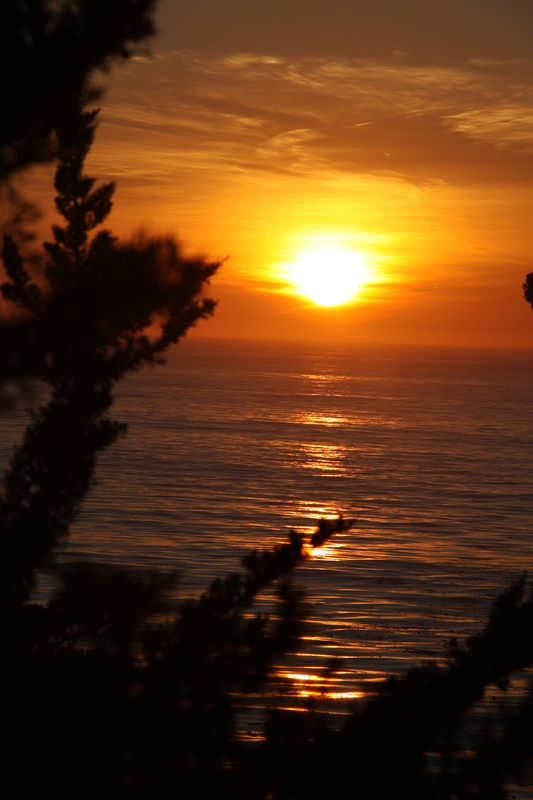 I just returned from a long weekend in Big Sur. It’s been tradition during the past 3 Thanksgiving weekends to drive up the coast and attend my friend Shiva’s yoga retreat. It’s something I look forward to every year. But this year, having literally just returned from back-to-back trips to the Arctic and Turks & Caicos, I actually considered not going. I wasn’t sure I felt up to more travel and was enjoying my time at home. I also felt completely relaxed and re-treated (or so I thought). Thankfully I listened to the other voice in my head – the one that reminded me how important it is to disconnect from the phone, computer, and daily routines, and to reconnect with myself, friends, and a more natural rhythm of life. I drove up the coast Friday morning and was immediately at ease, with the ocean by my side the entire way. I turned my phone off before I officially went off the grid and dropped completely into the experience. Life still happens without a phone – in fact, it happens without interruption. I took my time driving up the coast and found a little beach town to get lost in along the way. The town had one main street, only 5 blocks long. 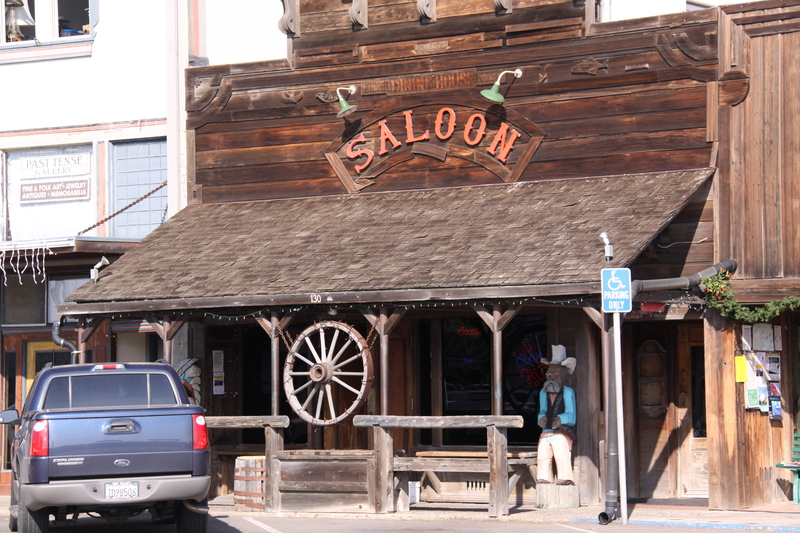 There was an old saloon and a restaurant that looked like a pirate ship. I ate lunch at the pirate ship restaurant, and sat on the upstairs deck outside, overlooking the ocean. The town was simple and charming – if I ever dissapear, it’s possible I took up residence there. As I continued driving I noticed an Elephant Seal viewing area on the side of Highway 1. In the dozen times I’ve made this drive previously, I never noticed this turn-off. It’s easier to pay attention without the cell phone! 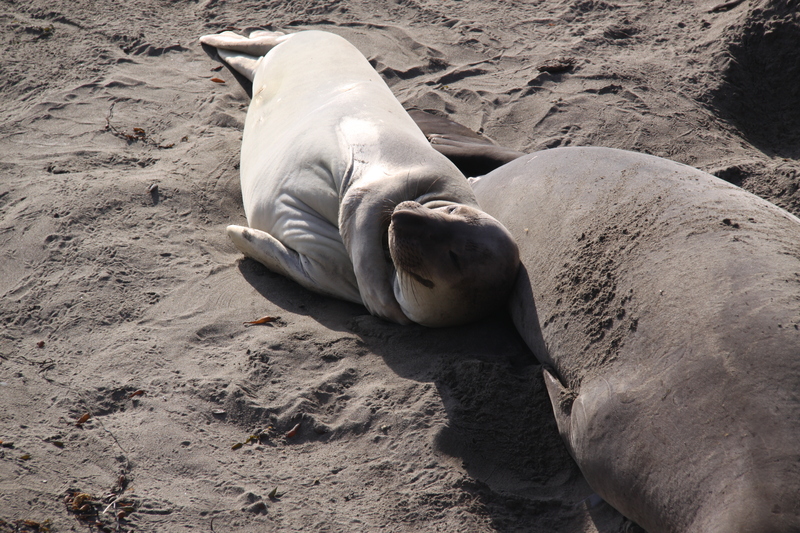 I pulled over and checked out the elephant seals. They can weigh up to 2 tons and are NOT pretty animals. It was odd to see all these huge beasts lying on the beach – they looked almost prehistoric. There was one little, white seal who was loving the sun and appeared to be smiling as she scratched her head with her fin and then settled back to sleep – she was pretty cute. I arrived at the retreat center around 3:30 and went straight into the hot springs. 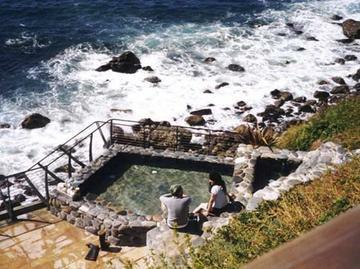 The hot springs overlook the ocean and provide instant relaxation. 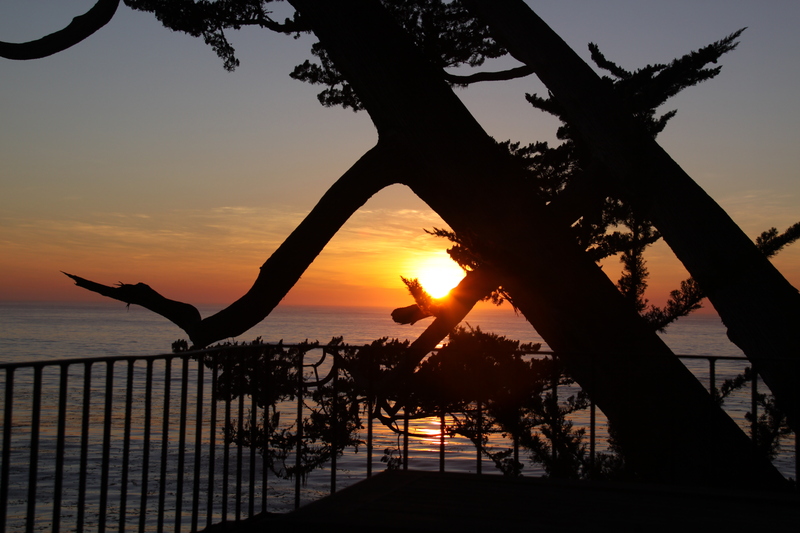 As it turned out, all my friends decided to take a leisurely drive up to Big Sur, so we all arrived “late” (between 4 and 6pm instead of 2pm). With no phones, we just trusted we’d find each other there whenever we all arrived. And of course we did. We connected at dinner and then went dancing in the dance dome. After we finished dancing we each picked up an instrument (my friends provided the live music) and started jamming. We were just playing, free-form and having so much fun. I looked around at this group of 10 particular friends I hadn’t seen in a few months and just smiled. It felt like home to be reunited. Also, while this was billed as a “yoga retreat,” this group of friends inherently makes the dynamic more of a party. Y’know when you have a friend who you have too much fun with (not that there is such a thing); that person whose eyes light up when he looks at you and says “uh oh, trouble is here!”? Well, there were 10 of us who feel that way about each other so needless to say we had a lot of fun! After dancing and our impropmtu jam session, we went back down to the hot springs for a couple hours (they’re open 24-hours). We caught up and relaxed some more. Ambika, Joey, Kishan, Janet, Kristin, and I gathered in another room on the property, sat in a circle and caught up for a little while. We laughed and plotted our night’s activities – sleep was NOT on the agenda. After everybody else went to bed, the 6 of us returned to the hot tubs, reunited with our other friend Matt, and soaked for a couple hours. At about 2am Ambika and I went upstairs to the deck, pushed a couple massage tables together, laid down, and looked up at the stars. There were no city lights obstructing the view and so many stars that it almost looked like there was more light than darkness. And then we saw a shooting star. “Let’s count shooting stars!” I said and Ambika agreed. 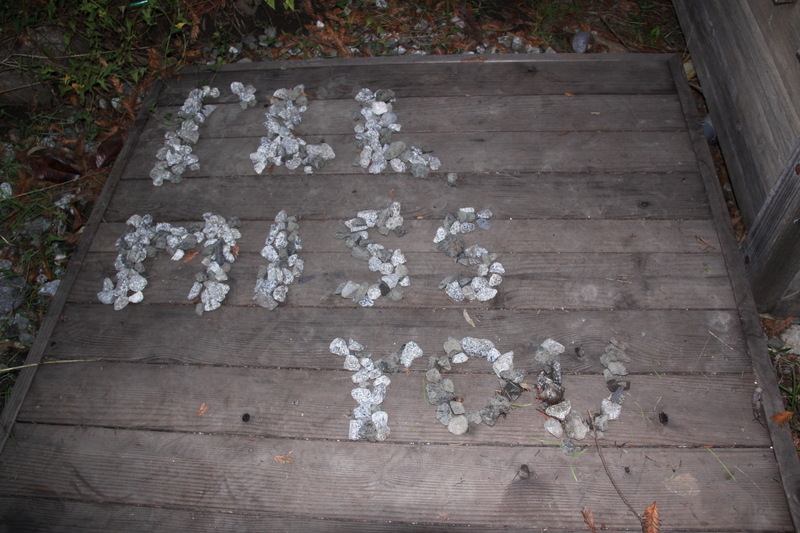 We turned it into a game, keeping track of how many shooting stars each of us saw. After about an hour (and 7 shooting stars later), our friends Janet and Matt came up and joined us. “What are you guys doing?” Matt asked. “We’re counting shooting stars,” I replied. “Ambika has 4 and I have 3,” I said. Soon, the score was: Ambika 7, Colette 6, Janet 2, Matt 1. Then our friend Joey joined us, which required adding one more massage table to our star gazing station. We explained the game to him and before long Joey had seen 2 shooting stars himself. Finally, we heard “awwww, wow…. what’s going on here?” as Kishan approached. He took a picture of us (which I’ll post when he sends it to me). At one point security came by and shined a flashlight on us. “What are you doing?” the guard asked. The final score was Colette 11, Ambika 10, Janet 5, Joey 2, Matt 1. This is one of my most favorite moments in life so far (and not because I won “the game”). To be able to lie down, look at the sky and count shooting stars is so simple, beautiful, fun, and fulfilling. Everybody should do it! And if you can do it with a handful of close friends, it’s even better. It felt familiar as if I’d done it once before when I was a little girl (but I don’t think I have done it before). It made us all feel like kids. At one point Matt said, “This is a dream, but it isn’t a dream. This is amazing!” It felt like we were characters in a fairy tale. Many of our adventures involve travel to foreign countries, all-night parties, long hikes, or some involved plan. It was a striking contrast to have so much fun and hear so many giggles engaging in the simplicity of counting shooting stars. “We have to come here every year. This is our thing. We created ‘a thing’ and it’s important that we always come back here together and share moments like these,” Joey said. Eventually, we made our way back to our rooms – the sun was about to rise and put a damper on our shooting star game and we had about 4 hours to sleep before our morning yoga practice. Sunday was another beautiful day. 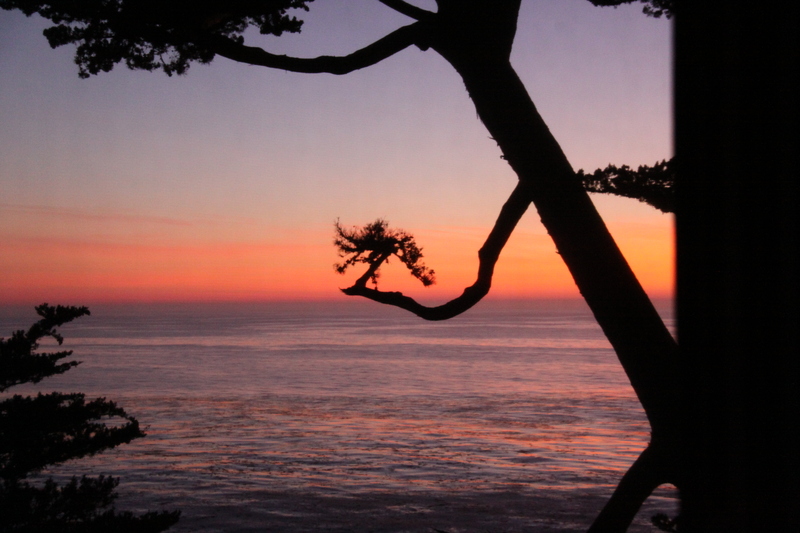 It felt like summer, clear skies and warm – rare for late-November in Big Sur. We had brunch after yoga and then made our way back to the tubs. Our Sunday departure tradition for the past 3 years has been to spend the day in the tubs and leave in the evening after most of the holiday traffic has died down. At one point Daphne and I were discussing options during Labor Day weekend 2009 – Burning Man, Spirit Bear trip in British Columbia, or a trip to the South of France. “Well, it’s a win-win-win decision,” I said. “And look where we’re sitting now,” Daphne reminded me as we soaked in hot tubs, suspended above the ocean. 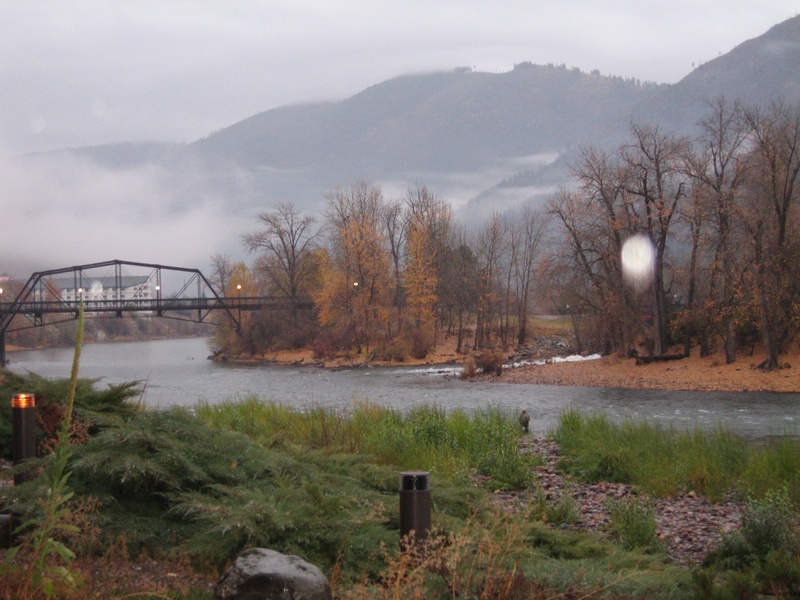 I arrived in Missoula, Montana last night. Monica, who works at the Bear foundation, picked me up at the airport and introduced me to Montana by taking me to the local dive bar. I met a bunch of great people at the bar – some of the nicest people in the world (and not just because they had a few drinks in them). When people heard I was going on this trip they asked, “what kind of ‘Ologist are you? !” expecting a response such as, “Biologist,” “ecologist,” or “geologist.” Instead, I responded, “I’m a fun-ologist!” I’m here to live, have fun, and meet people (and polar bears). To share these experiences and hopefully inspire others to embark on their own adventures, raise consciousness, affect positive change. In the time that’s passed since the dream, I’ve changed. Not who I am of course, but how I live. It wasn’t a fully conscious decision or something born out of guilt or obligation. It just started happening. I was taking shorter showers, recycling everything that could be recycled, trading in plastic bottles for Nalgene, and replacing household cleaners with non-toxic, biodegradable alternatives. But after the dream came a true awakening. I don’t need to think about it anymore. It’s no longer a decision I’m making. It’s just the way I live. It feels effortless. As I learn about additional alternatives, I adopt them. Seventh Generation products are everywhere in my home (shouldn’t ALL toilet paper be made from recycled paper?!? Do we really need to be using new trees to wipe our a$$?!). What if every hotel, gym, office building, and restaurant used toilet paper made from recycled materials? What if every household did the same? low-flow shower heads (which most of us have now) still flow approximately 2.5 gallons of water per minute. My 5-gallon sun showers have lasted as long as 5 – 10 minutes and was all that was needed to be thoroughly showered. The shift was natural. It doesn’t feel extreme. And I know there are more changes I can make that would have a positive impact on the environment. It’s all connected – the dream, the polar bears, the way I live. What I do here, today, affects the polar bears I’m going to see in a few days. Posted in Polar Bears, U.S. I initially intended to write about the remainder of my Turks & Caicos trip and share fun stories and pictures. But the journey hasn’t quite come to a close yet. As it turns out, I met a really kind man at the Providenciales airport. So I’ll begin with his story. The other stories will follow shortly. He continued, reciting information he’d heard on the news, concerns about voter fraud, concerns about Ohio. He is as informed about the issues and current events as most Americans I know and this election is just as, if not more, important to him as it is to us. “Well, I hope we do see each other in the future,” I replied as I stood up to gather my bags and get on the plane bound for Miami. “I will keep you in my heart” he said with a big smile, hand on his heart. Posted in General Travel, Turks & Caicos, U.S.